Download "3. FACT SHEET ON INCORPORATED SOCIETIES"
1 DECEMBER 2005 FACT SHEET ON 3. FACT SHEET ON This fact sheet deals with incorporated societies. These are organisations that have at least 15 members and are registered under the Incorporated Societies Act Members associate together for a mutual lawful interest other than the pursuit of profit. KEY FEATURES OF Once registered, all current members and subsequent members are considered to be a body corporate under the name of the society. A member that is a body corporate, such as another incorporated society, counts as three individual members. The incorporated society takes on a separate legal identity distinct from its members. The incorporated society has a continuing existence until being wound up. This is independent of changes to membership (providing the number of members does not fall below 15). Incorporated societies are also limited liability entities, unless their rules provide otherwise. This means that members of an incorporated society are not liable in respect of any obligation incurred by the society. Limits on the activities of the incorporated society are provided for in the Incorporated Societies Act and the rules that the society adopts for itself. 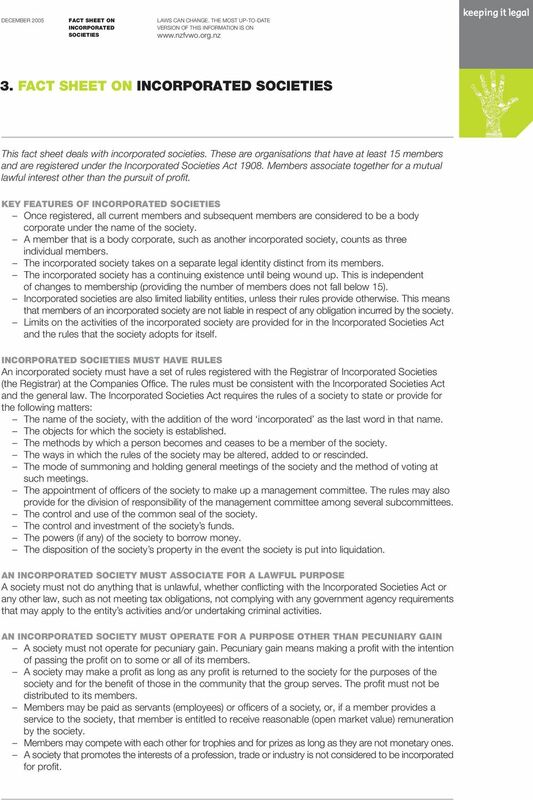 MUST HAVE RULES An incorporated society must have a set of rules registered with the Registrar of Incorporated Societies (the Registrar) at the Companies Office. The rules must be consistent with the Incorporated Societies Act and the general law. The Incorporated Societies Act requires the rules of a society to state or provide for the following matters: The name of the society, with the addition of the word incorporated as the last word in that name. The objects for which the society is established. The methods by which a person becomes and ceases to be a member of the society. The ways in which the rules of the society may be altered, added to or rescinded. The mode of summoning and holding general meetings of the society and the method of voting at such meetings. The appointment of officers of the society to make up a management committee. The rules may also provide for the division of responsibility of the management committee among several subcommittees. The control and use of the common seal of the society. The control and investment of the society s funds. The powers (if any) of the society to borrow money. The disposition of the society s property in the event the society is put into liquidation. AN SOCIETY MUST ASSOCIATE FOR A LAWFUL PURPOSE A society must not do anything that is unlawful, whether conflicting with the Incorporated Societies Act or any other law, such as not meeting tax obligations, not complying with any government agency requirements that may apply to the entity s activities and/or undertaking criminal activities. AN SOCIETY MUST OPERATE FOR A PURPOSE OTHER THAN PECUNIARY GAIN A society must not operate for pecuniary gain. Pecuniary gain means making a profit with the intention of passing the profit on to some or all of its members. A society may make a profit as long as any profit is returned to the society for the purposes of the society and for the benefit of those in the community that the group serves. The profit must not be distributed to its members. Members may be paid as servants (employees) or officers of a society, or, if a member provides a service to the society, that member is entitled to receive reasonable (open market value) remuneration by the society. Members may compete with each other for trophies and for prizes as long as they are not monetary ones. A society that promotes the interests of a profession, trade or industry is not considered to be incorporated for profit. 2 02 AN SOCIETY MUST OPERATE FOR A PURPOSE OTHER THAN PECUNIARY GAIN (CONTINUED) If the society does not have charitable status, it is allowed to divide the property of the society among its members on its dissolution. 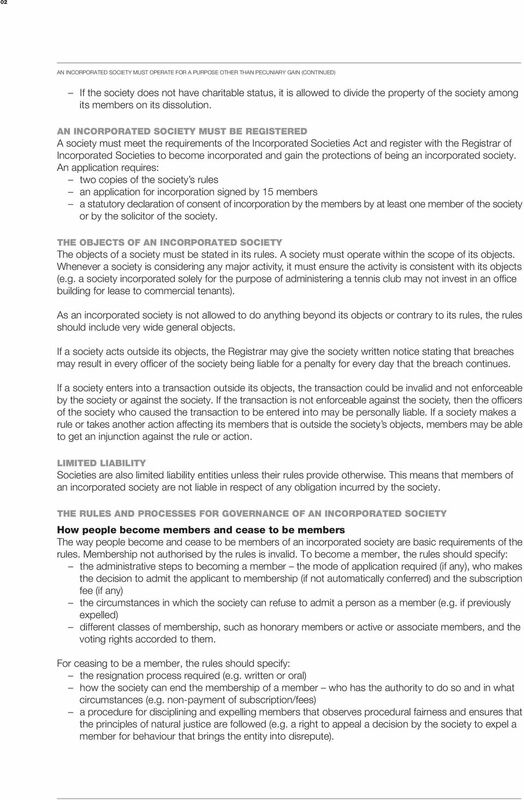 AN SOCIETY MUST BE REGISTERED A society must meet the requirements of the Incorporated Societies Act and register with the Registrar of Incorporated Societies to become incorporated and gain the protections of being an incorporated society. An application requires: two copies of the society s rules an application for incorporation signed by 15 members a statutory declaration of consent of incorporation by the members by at least one member of the society or by the solicitor of the society. THE OBJECTS OF AN SOCIETY The objects of a society must be stated in its rules. A society must operate within the scope of its objects. Whenever a society is considering any major activity, it must ensure the activity is consistent with its objects (e.g. a society incorporated solely for the purpose of administering a tennis club may not invest in an office building for lease to commercial tenants). 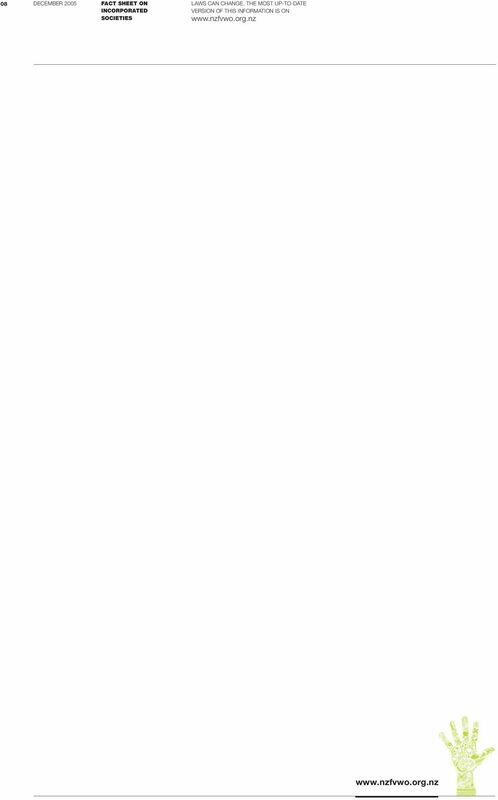 As an incorporated society is not allowed to do anything beyond its objects or contrary to its rules, the rules should include very wide general objects. If a society acts outside its objects, the Registrar may give the society written notice stating that breaches may result in every officer of the society being liable for a penalty for every day that the breach continues. If a society enters into a transaction outside its objects, the transaction could be invalid and not enforceable by the society or against the society. If the transaction is not enforceable against the society, then the officers of the society who caused the transaction to be entered into may be personally liable. If a society makes a rule or takes another action affecting its members that is outside the society s objects, members may be able to get an injunction against the rule or action. LIMITED LIABILITY Societies are also limited liability entities unless their rules provide otherwise. This means that members of an incorporated society are not liable in respect of any obligation incurred by the society. THE RULES AND PROCESSES FOR GOVERNANCE OF AN SOCIETY How people become members and cease to be members The way people become and cease to be members of an incorporated society are basic requirements of the rules. Membership not authorised by the rules is invalid. 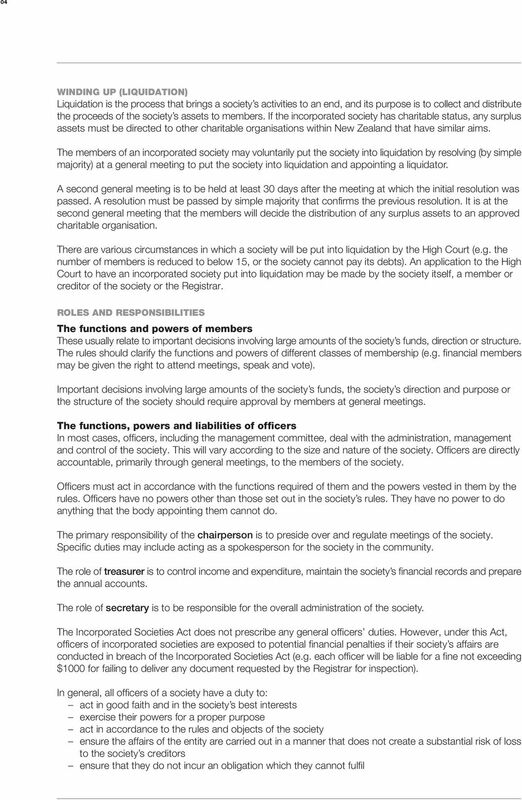 To become a member, the rules should specify: the administrative steps to becoming a member the mode of application required (if any), who makes the decision to admit the applicant to membership (if not automatically conferred) and the subscription fee (if any) the circumstances in which the society can refuse to admit a person as a member (e.g. if previously expelled) different classes of membership, such as honorary members or active or associate members, and the voting rights accorded to them. For ceasing to be a member, the rules should specify: the resignation process required (e.g. written or oral) how the society can end the membership of a member who has the authority to do so and in what circumstances (e.g. non-payment of subscription/fees) a procedure for disciplining and expelling members that observes procedural fairness and ensures that the principles of natural justice are followed (e.g. a right to appeal a decision by the society to expel a member for behaviour that brings the entity into disrepute). 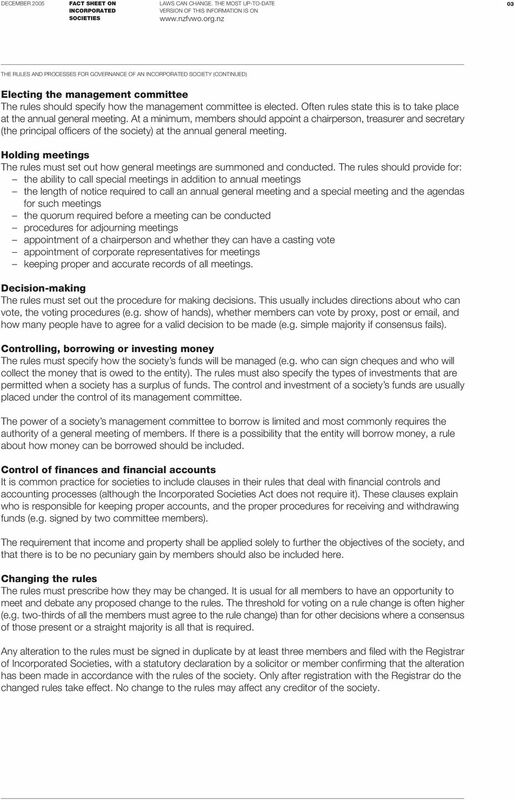 3 DECEMBER 2005 FACT SHEET ON 03 THE RULES AND PROCESSES FOR GOVERNANCE OF AN SOCIETY (CONTINUED) Electing the management committee The rules should specify how the management committee is elected. Often rules state this is to take place at the annual general meeting. At a minimum, members should appoint a chairperson, treasurer and secretary (the principal officers of the society) at the annual general meeting. Holding meetings The rules must set out how general meetings are summoned and conducted. The rules should provide for: the ability to call special meetings in addition to annual meetings the length of notice required to call an annual general meeting and a special meeting and the agendas for such meetings the quorum required before a meeting can be conducted procedures for adjourning meetings appointment of a chairperson and whether they can have a casting vote appointment of corporate representatives for meetings keeping proper and accurate records of all meetings. Decision-making The rules must set out the procedure for making decisions. This usually includes directions about who can vote, the voting procedures (e.g. show of hands), whether members can vote by proxy, post or , and how many people have to agree for a valid decision to be made (e.g. simple majority if consensus fails). Controlling, borrowing or investing money The rules must specify how the society s funds will be managed (e.g. who can sign cheques and who will collect the money that is owed to the entity). The rules must also specify the types of investments that are permitted when a society has a surplus of funds. The control and investment of a society s funds are usually placed under the control of its management committee. The power of a society s management committee to borrow is limited and most commonly requires the authority of a general meeting of members. If there is a possibility that the entity will borrow money, a rule about how money can be borrowed should be included. Control of finances and financial accounts It is common practice for societies to include clauses in their rules that deal with financial controls and accounting processes (although the Incorporated Societies Act does not require it). These clauses explain who is responsible for keeping proper accounts, and the proper procedures for receiving and withdrawing funds (e.g. signed by two committee members). The requirement that income and property shall be applied solely to further the objectives of the society, and that there is to be no pecuniary gain by members should also be included here. Changing the rules The rules must prescribe how they may be changed. It is usual for all members to have an opportunity to meet and debate any proposed change to the rules. The threshold for voting on a rule change is often higher (e.g. two-thirds of all the members must agree to the rule change) than for other decisions where a consensus of those present or a straight majority is all that is required. Any alteration to the rules must be signed in duplicate by at least three members and filed with the Registrar of Incorporated Societies, with a statutory declaration by a solicitor or member confirming that the alteration has been made in accordance with the rules of the society. Only after registration with the Registrar do the changed rules take effect. No change to the rules may affect any creditor of the society. 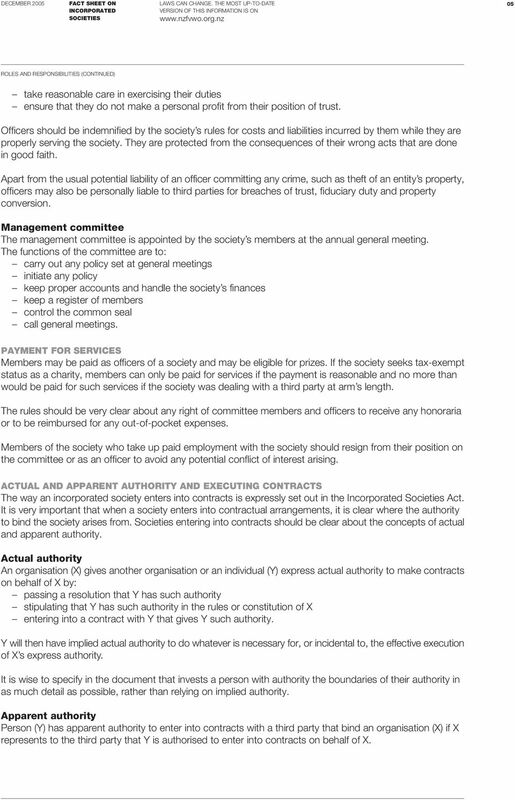 5 DECEMBER 2005 FACT SHEET ON 05 ROLES AND RESPONSIBILITIES (CONTINUED) take reasonable care in exercising their duties ensure that they do not make a personal profit from their position of trust. Officers should be indemnified by the society s rules for costs and liabilities incurred by them while they are properly serving the society. They are protected from the consequences of their wrong acts that are done in good faith. Apart from the usual potential liability of an officer committing any crime, such as theft of an entity s property, officers may also be personally liable to third parties for breaches of trust, fiduciary duty and property conversion. Management committee The management committee is appointed by the society s members at the annual general meeting. The functions of the committee are to: carry out any policy set at general meetings initiate any policy keep proper accounts and handle the society s finances keep a register of members control the common seal call general meetings. PAYMENT FOR SERVICES Members may be paid as officers of a society and may be eligible for prizes. If the society seeks tax-exempt status as a charity, members can only be paid for services if the payment is reasonable and no more than would be paid for such services if the society was dealing with a third party at arm s length. The rules should be very clear about any right of committee members and officers to receive any honoraria or to be reimbursed for any out-of-pocket expenses. Members of the society who take up paid employment with the society should resign from their position on the committee or as an officer to avoid any potential conflict of interest arising. ACTUAL AND APPARENT AUTHORITY AND EXECUTING CONTRACTS The way an incorporated society enters into contracts is expressly set out in the Incorporated Societies Act. It is very important that when a society enters into contractual arrangements, it is clear where the authority to bind the society arises from. Societies entering into contracts should be clear about the concepts of actual and apparent authority. Actual authority An organisation (X) gives another organisation or an individual (Y) express actual authority to make contracts on behalf of X by: passing a resolution that Y has such authority stipulating that Y has such authority in the rules or constitution of X entering into a contract with Y that gives Y such authority. Y will then have implied actual authority to do whatever is necessary for, or incidental to, the effective execution of X s express authority. It is wise to specify in the document that invests a person with authority the boundaries of their authority in as much detail as possible, rather than relying on implied authority. Apparent authority Person (Y) has apparent authority to enter into contracts with a third party that bind an organisation (X) if X represents to the third party that Y is authorised to enter into contracts on behalf of X. 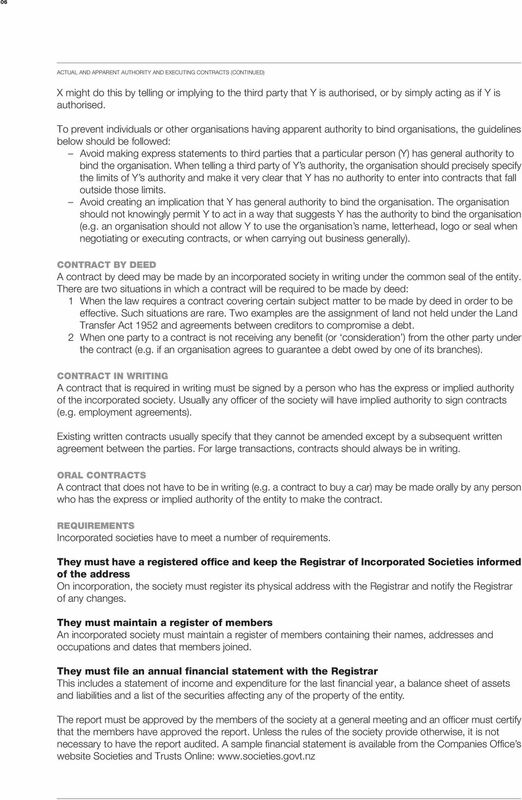 7 DECEMBER 2005 FACT SHEET ON 07 REQUIREMENTS (CONTINUED) They must file changes to the rules with the Registrar Any alteration to the rules must be signed in duplicate by at least three members and filed with the Registrar, with a statutory declaration by a solicitor or member confirming that the alteration has been made in accordance with the rules of the society. They must understand the Registrar s powers of inspections The Registrar may, for the purpose of monitoring a society s compliance with the Incorporated Societies Act, require the society to hand over any registers, records, accounts, books or papers kept by the society. NEW REPORTING REQUIREMENTS There will be reporting requirements for incorporated societies that register for charitable status with the Charities Commission (see Fact sheet 7), and there may be reporting requirements required of charitable entities as a result of the review of the Financial Reporting Act Law resulting from this review may be passed in RESOURCES Fact sheets Fact sheet 7 Charities Commission Websites The Charities Commission is responsible for registering charities from 2006 onwards. The How-to Guides section has a community development resource kit covering all aspects of establishing and running an organisation. The Department of Internal Affairs has information about administering lottery grants and community grants schemes. 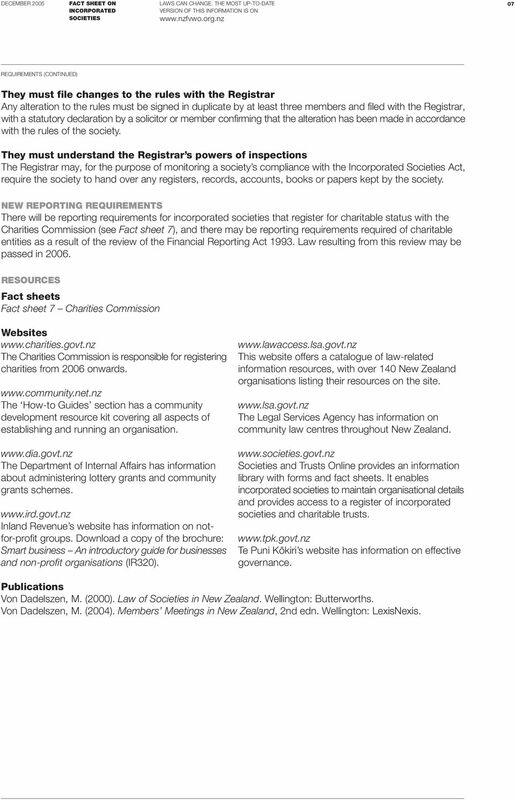 Inland Revenue s website has information on notfor-profit groups. Download a copy of the brochure: Smart business An introductory guide for businesses and non-profit organisations (IR320). This website offers a catalogue of law-related information resources, with over 140 New Zealand organisations listing their resources on the site. The Legal Services Agency has information on community law centres throughout New Zealand. Societies and Trusts Online provides an information library with forms and fact sheets. It enables incorporated societies to maintain organisational details and provides access to a register of incorporated societies and charitable trusts. Te Puni Kokiri s website has information on effective governance. Publications Von Dadelszen, M. (2000). Law of Societies in New Zealand. Wellington: Butterworths. Von Dadelszen, M. (2004). Members Meetings in New Zealand, 2nd edn. Wellington: LexisNexis. [ ] numbers in brackets refer to the clause number in the regulations. Memorandum And Articles Of Association for Company Limited by Guarantee Memorandum of Association of Transport Planning Society Ltd 1. Name The Company's name is The Transport Planning Society Ltd. 2.